LONDON, ENGLAND. 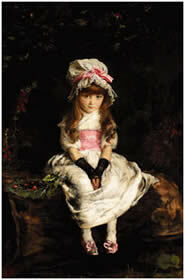 - Cherry Ripe, one of Sir John Everett Millais’ (1829-96) best loved and most well-known paintings, is to be included in Sotheby’s sale of Important British Pictures on Thursday, July 1, 2004. An iconic image of Victorian childhood, it contributed greatly in establishing Millais as the most successful painter of his generation. It was first exhibited in 1881 and was instantly popular but apart from a brief appearance in a Royal Academy exhibition in 1958, it has been out of sight for several decades. It is estimated at £800,000-1,200,000. Suave, sophisticated and immensely talented, Millais is still regarded as one of the most popular British artists, more than a hundred years after his death. He understood and sought to capture the beauty of childhood and his series of portraits of young sitters have an intensity of beauty in which youth is taken as the subject and treated with the most tender of sentiment. Cherry Ripe was the best known from the series of which he painted between 1860 and 1880. It was inspired by an 1879 fancy dress ball hosted by perhaps the most influential of all 19th century art journals, The Graphic. Edie Ramage (later Mrs Francisco de Paula Ossorio), the young niece of the magazine’s editor, Mr. Thomas, came to the ball wearing a costume similar to one worn by the sitter in Sir Joshua Reynolds’ portrait of Penelope Boothby. Millais was so struck by Edie’s appearance that immediately after the ball she was taken to his studio, where he began a portrait for her uncle with a price tag of a thousand guineas. ’Thanks to the engraver’s and woodcutter’s art, "Cherry Ripe" found its way into the remotest parts of the English-speaking world, and everywhere that sweet presentment of English Childhood won the hearts of the people. From Australian miners, Canadian backwoodsmen, South African treckers, and all sorts and conditions of colonial residents, came to the artist letters of the warmest congratulation, some of which stirred his heart by the deep emotion it expressed. LONDON, ENGLAND. - A remarkable portrait of King Edward VI which has been in the same family for over 400 years is one of the highlights of Christie’s Important British and Irish Art Evening Sale on 9 June 2004. One of George Romney’s most important portraits of Lady Hamilton, the artist’s great muse and celebrated mistress of Horatio, Lord Nelson is a further highlight. Intriguing and romantic Pre-Raphaelite works from the John H. Schaeffer Collection will also be offered together with portraits by Gainsborough and Zoffany from the Estate of Mary, Viscountess Eccles. Portrait of Emma Hart, Lady Hamilton as a Dancing Bacchante by George Romney (1734-1802) (estimate: £300,000-500,000) is considered to be one of his most important portraits of Nelson’s mistress. A celebrated beauty, Emma Hamilton captivated Romney who first met her in 1782 and over the next nine years he immortalised her in many different guises, creating some of his most famous paintings. Offered from a private Swedish collection where it has been for the last twenty-five years, the picture dates from 1791 when Emma briefly returned to London from Naples, spurring Romney into beginning a new series of portraits of her. Emma fell in love with Nelson after the Battle of the Nile (1798), when she and her husband William Hamilton, the British Ambassador at Naples, offered the wounded victor hospitality. Emma and Nelson returned to England in 1800 where a daughter was born. The affair was an international scandal, but it enhanced Nelson’s reputation as a romantic hero. At his death, in 1805, Nelson entrusted Emma’s care to the nation, but this was ignored by the government. She died a pauper in France in 1813. The tragic life of King Edward VI (1537-1553), the only, and much longed for, son of Henry VIII (by his third wife Jane Seymour), was cut short when the frail young man died at 15 years old, possibly from a combination of tuberculosis and the measles. During his brief reign, Edward demonstrated impressive piety and intelligence and had he lived into manhood, he potentially could have become one of England’s greatest kings. 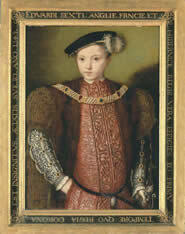 Crowned King of England at the tender age of 9 years old, this portrait depicts the young King aged about 11 years old (estimate: £400,000-600,000) and relates closely to the Royal Collection portrait at Windsor Castle. Until recently the portrait hung in the main gallery at Loseley House in Surrey and had been passed down through the family. It is likely that the portrait was acquired by Sir Christopher Moore’s son, Sir William Moore, one of Queen Elizabeth I’s most trusted advisers, who built Loseley House between 1562 and 1568.